Do you have a bat in your house right now? A bat in your house can be a frightening experience. It is also a potentially serious situation. With the information on this page, you can handle this in a calm and safe way. Making a good decision right now can save you worry and money. Please read carefully. The bat wants out of the house – there is no food or water for it in your home. The bat is disoriented and lost. Bats are not aggressive – but will bite if cornered. Bats’ teeth are very small. They typically will not bite through jeans or leather gloves. A percentage of bats carry rabies. *Rabies is reportedly very rare in the UK. If you live in the UK and have a bat in the house, please contact the Bat Conservation Trust either on National Bat Helpline at 0345 1300 228 or by emailing them at enquiries@bats.org.uk. Laws surrounding bats are very different in the UK and EU than they are in the United States. STEP ONE – Very Important! If there is ANY chance the bat has come in contact with someone in your house, the situation needs to be handled as a potential rabies exposure. A bat bite can be very small, and may not be detected. Was the bat discovered in a room where someone was sleeping? Are there young children who may not communicate their contact with the bat? Is there a dog or cat in the house? Option 2 – Anyone who had potential contact with the bat needs a rabies shot. Rabies shots are no longer in the stomach, but they can be very expensive (at least $3500 per person, sometimes significantly more). Rabies is fatal unless shots are administered before symptoms appear. (Your pet may already have current rabies shots. If not, with the assistance of a veterinarian, your pet can be quarantined and then vaccinated at considerable less cost). Capturing the bat is the best thing you can do in this situation. 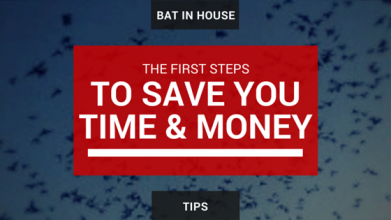 Odds are the bat will not test positive, and you will save the concern and money. If You Can Be Certain The Bat Did Not Come Into Contact With Anyone, Proceed To STEP TWO. Bats look big when they are flying around, but here in the United States, they rarely weigh more than a couple ounces. When not flying, bats can crawl and hide in very small places. Here are the steps we recommend to capture the bat. Isolate the bat. Close doors to other parts of the house, possibly even putting a towel on the ground to prevent the bat from crawling under the closed doors if there is a gap. Should you lose track of the bat, it can be very disconcerting to wonder if it could possibly be hiding in your bedroom. Keep an eye on the bat. Many hours can be spent searching the house/room for the lost bat if it goes into hiding. Save yourself the headache by having someone keep an eye on it. Contact your local animal control department. In some rural areas, or after business hours, the police department may handle the animal control services. Tell the animal control officer you have an emergency, there is a bat in the house, and there is a possible exposure to rabies. The animal control officer may come and take over the situation from there. Wear some gloves and long pants when trying to capture a bat. Bats have a difficult time taking flight from the ground. If you can knock the bat to the ground with a broom or towel, it will be slower moving and vulnerable. Usually a bat on the ground will try and crawl (very slowly) to a wall, then climb up the wall. Its ideal way to take flight is to drop from its perch a few feet to gain airspeed. A dead bat can still be tested for rabies, provided the head is intact. An empty coffee can or wastebasket can often be placed over the top of a bat to capture it. A fishing net also works well. A towel can be tossed over the bat (this is not a good way to store the bat, as it will crawl out from under it eventually). If you leave the bat in the room under a can, make sure you don’t leave any pets in the room. Open a door or window as close to the bat as possible. The bat wants to be outside where it can find food and water. It also wants to get away from all the scary humans. It will eventually (could take up to an hour sometimes) sense the fresh air movement and fly outside. Keep an eye on the bat. Many hours can be spent searching the house/room for the lost bat if it goes into hiding. Save yourself the headache by having someone keep an eye on it. When it does fly out, it will be sudden – and quiet. It may circle the room from time to time before it discovers the open window. If you are exceptionally brave or feeling impatient – read the information above in the in STEP ONE under the topic “Capturing the Bat“. There Are Only Three Possible Reasons You Had A Bat In Your House Or Building. 1. Most Likely: The bat’s nest or colony is somewhere in your house. Bats do not live alone. The colony often establishes a nest along a roof-line behind siding, behind a chimney, inside walls, or even in an attic. The first sign of infestation is often a bat appearing in the house. 2. Fairly Common: The bat used to have a nest in the house or building, and is trying to find its way back. If you have had bats excluded from your home in the past 12 months (or longer if it was a serious infestation), the bats will instinctively keep trying to return to their old nest from time to time. An open window or door may be exploited by the bat as it tries to find its way home. 3. Very Rare: The bat just accidentally flew in your window. There is no food or water for bats in your home. The confined spaces of your rooms, along with the fact that you live there – make the interior of a house a place bats would normally want to avoid. Interestingly, most people first assume their case is situation #3 above. It is often only after a person has a bat in the house on several occasions they begin to suspect they have an infestation. We’ve found bat colonies in homes that were recently built (only two years old). Having a very nice home, or a very well maintained home will not stop a colony of bats from moving in. They can exploit a surprisingly small opening to find a place to nest. Homes and buildings are designed to keep out falling rain – but also to breathe or vent. Bats can crawl up walls, or even along ceilings to find a way in. Here are some things you can look for to see if you have bats living somewhere in your home. Bat droppings look just like mouse droppings. Look for these on the outside of your home, on your porch, window sills, etc. Scratching in the walls or ceiling – especially at dusk or before dawn – could be the bats crawling from their nest to their “door” to go outside to eat and then return. Bat mites are often mistaken for beg bugs – only they keep coming back despite efforts to control them by pest control treatment. For more information, please browse the articles on our web site.